Introducing….. – Dirty wet dog , boats and sailing. Deben 4 tonner : Inanda. This week the 2 departmental boat-heads, Dee and me, should both be completing on our new boats. At some time i will feature Dee and her boat as she has also had a professional sailing life driving the same kind of boats that i did. If the purchase and survey all work out for her than Dee will soon be the owner of a good looking 30 footer. There is a bit of odd synchronicity there in that i have just come across a really good youtube channel (Free range sailing) based on a 30 foot ‘basic’ sloop in northern Australian waters and that 30 feet is almost the ideal size for a simple ocean going or long term cruising boat for a couple. Anyway, allow me to introduce Inanda. Inanda is a late version of the Deben 4 ton class. She was built in 1949 at Whisstocks yard at Woodbridge and as far as we can tell has always been kept on the east coast. For those not familiar with UK waters or the east coast the Deben is one of the Suffolk rivers north of the Thames estuary. I hardly know the area at all having only once sailed up the Thames at night in a maxi yacht many years ago…..apparently the chart changes so often that a new one is printed every few years….mine is more than 25 years out of date !. I have mentioned that i briefly owned one of this class before although that one was a much worse example and needed far more work than i was willing to do at that point in my own sailing life. Inanda needs some work and lots of care but then all wooden boats do. The main jobs at some time will be repairing cracked and sistered frames and sorting out some minor leaks in the coachroof. Aside from that she needs her brightwork attending to to make her look her best. 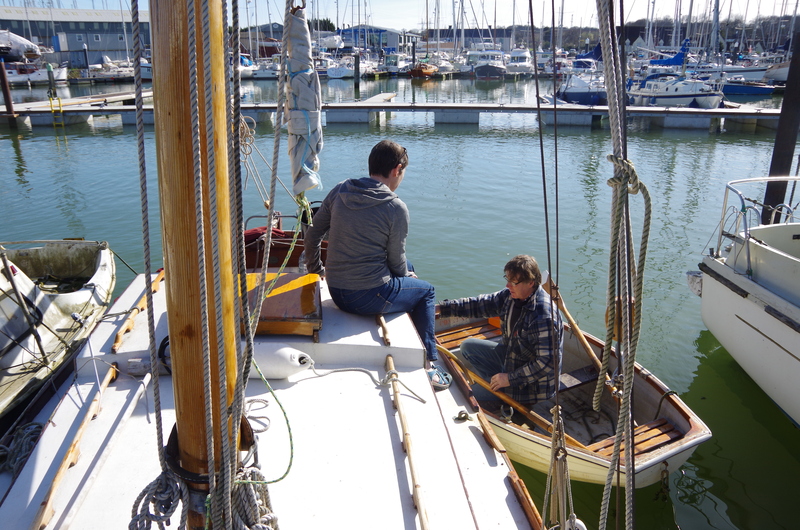 I do also intend to make her a very comfortable and functional small cruising boat with some changes to the interior layout and cockpit although for now what she will get is a thorough wash-out and me learning how to set up and sail the classic gaff rig. I’ve never had a ‘proper’ gaffer either, only a small catamaran rigged with a high aspect ‘Dutch’ short-gaff rig and soft wingsail. Inanda has a beautiful mast and spars and solid, chunky looking gear. I think she carries more sail area than a standard Gaff rigged Deben as the boom and gaff have both beenn extended so there is a lot of sail higher and further aft. That might explain (Al) the amount of helm on in a photograph when powered up to windward. I have seen the sails which look to be in very good condition, i think the mains’l is over 230 sq feet. She has a decent bowsprit which can be shipped inboard, a jib on a Wykeham furling drum and then a staysail , both headsails are pretty small so she is s true cutter and doesn’t have any sheet winches. The rig is stayed conventionally, i counted 4 per side, galvanised wire and lashings….all simple stuff….i used to be able to hand-splice galvanised wire although its an unpleasant job. She does have a cruising chute in a sock, doesn’t have a topsail or as yet a trysail. I quite fancy the idea of having a furling genoa on say a vectran luff and would love to sail with a topsail ! Inanda is a raised-strake version of the original design which apparently gives her 4 inches more height in the topsides. She also has a small raised section of coachroof aft with a slightly awkward step which seems to be a bit leaky. Under that the interior layout is entirely conventional with a berth each side and a low forepeak. Just inside the companionway is a locker to stbd and the original galley space to port. An addition is the rather awkward hob which is mounted over the port berth. That would be easy-peasy to move and i am very tempted to have a single burner hob at first mounted where it would have been originally . Up foward she has a low forepeak with bunk spaces just ahead of a partial, non-structural bulkhead and a charcoal ‘pansy’ stove to stbd. As she is right now its a tight squeeze for me to get around the mast and i am already considering a first job of making that easier. I do like to have a proper forepeak on a boat and this one will become exactly that. An interesting observation is that my previous Deben was an awkward and twitchy boat until i stripped weight out of her bow, got rid of her huge and knackered capstan and generally lightenned the bow. This one will get stripped out and become a proper area to stow sails, fenders and lines. The anchor chain stowage is typically too far forrad so that will be coming aft towards the mast as well. In one of the first ‘salty’ project posts i hope you will see that happening. I think is a 2-pot Volvo. It started well and runs a lot more smoothly than the single-pot donk-a-donk that i had on the Frances. One problem is that the engine is under a non-draining cockpit which always makes me a bit nervous in an offshore boat…but she has been like that for her entire life so maybe all she needs for now is a gurt-big new bilge pump. The cockpit is a bit small and awkward as was my previous Deben. To be comfortable i will really need to be sitting at the forward end of the cockpit with a longer tiller and ultimately the pit needs a rethink. Well a true classic I feel, wooden blocks and all, and you have a heater already installed. As you say the varnish brush needs to come out, there is probably umpteen coats on already ! I spotted the wet patch in the corner of the coach roof that will need to be sorted, is the deck /cabin top glassed ? Engine looks to have survived well, its Volvo colour as opposed to rust brown !. I get nervous with the whole boat being the cockpit drain as well, can you mod it to make a sill and water tight cockpit with cross drains ? Looking forward to the new boat experience, whens the first sail due ? If all goes to plan i am going over there in a couple of days. a work colleague has kindly agreed to a shift swap so that i can spend 4 or 5 days over there. There’s quite a bit to do but i should be able to get sails up at some time. I will report on each problem area as i work out ways of dealing with them. She is certainly a classic, and a nice boat. Ok so there is some work to do to tidy her up and add your own marks of ownership to her, but then that applies to all pre owned boats as well as new. Should make a pleasant boat to cruise in either around west or east. You can also revive your racing activity as I believe she will be eligible for gaffer racing and events. It will be interesting to see what you do with her, and if she will satisfy your sailing and adventure urges. Good luck.